Sea level rise and projected future sea level rise will be covered in another article. Even if I click to enlarge I cannot see any trends. Yes, you found one of them. Glad I mentioned Poe’s law. Sheffield and Wood 2008 who show graphs. I don`t see any idea in using models when you have observable facts. Then I would call it statistics. Or the only idea behind models I can see is that it can be a way to test models. on February 12, 2017 at 3:11 pm | Reply Mike M.
nobodysknowledge wrote: “I don`t see any idea in using models when you have observable facts”. Data can be incomplete and might not directly measure the quantity desired. Models, constrained by the available data, can be used to fill in gaps. I think that is called “meteorological reanalysis” and I suspect that is what is being used in the papers SoD cites. Observations are not complete, either spatially or temporally so assumptions about representations including infilling are models. They are diagnostic models, not prognostic models, but models all the same. ..As precipitation and surface air temperature are the only two climate variables with long historical records, the PDSI makes full use of these data and can be readily calculated for the last hundred years or so for most land areas..
SOD, as you intimate, global warming follows from imposed radiative forcing. But, also as you intimate, storms, floods and droughts result from atmospheric dynamics and not from global warming. Temperature gradients determine Rossby wave dynamics and there have been cases made for weakened gradients (Francis) or strengthened gradients (Hansen). But when one reflects that even with constant gradients, dynamic range of waves could mean more or fewer storms, floods and droughts, the case for warming being a significant source of change appears quite low. TE: One way to look at big changes in precipitation is: What goes up must come down. Therefore consider changes in evaporation with GW. The rate of evaporation depends on surface wind speed and the undersaturation of the air over the oceans. According to Isaac Held, most climate models suppress the rate of evaporation by increasing relative humidity there from 80% to 81%, a 5% decrease in undersaturation. It seems very strange for GW to be accompanied by far less than the expected +7%/K increase in evaporation because convective transport (overturning) weakens. SOD: Dai review is can be found below. Its one of 20 versions found by Google Scholar – the first is behind a paywall. SOD: Do you intend to discuss the common theme: Climate change will make wet areas wetter and dry areas drier. I’ve heard speakers claim that there is a fundamental physical or meteorological reason for this generalization, but I’ve never found a compelling rational. How much wetter or drier is another important issue? As one moves towards the equator where it is warmer (or towards the equator while staying in the temperature zones outside the Hadley circulation), are wetter areas wetter and dry areas drier? This principle suggests that rainfall would have been more evenly distributed during the last ice age. On the average, ice ages were much drier and future warming will bring more precipitation. However, climate sensitivity is thermodynamically linked to how much precipitation can increase with temperature. In the long run, the change in surface and TOA energy balances (W/m2/K) must be the same (except for changes in albedo). +7%/degK is nearly impossible if climate sensitivity is high. +1-2%/degK is required unless cloud feedback is positive. I do plan to. One of the commonly cited papers for this is Robust Responses of the Hydrological Cycle to Global Warming, Held and Soden, Journal of Climate (2006). Thanks for the paper. It will be interesting to see what you have to say about the physics of changes in P-E. The prediction that precipitation will only increase by 1.7%/K due to a slowdown in atmosphere turnover comes from climate models, not physics equations. That prediction appears counter-intuitive to me. After an instantaneous doubling of CO2, the upper atmosphere warms much faster than the surface and that will certainly slow turnover – transiently. Once the planet’s average lapse rate returns to borderline instability, why doesn’t turnover return to normal or even increase? A major factor in the height of the tropopause is stratospheric heating from the absorption of solar UV by oxygen and ozone. You can’t have convection when the temperature is increasing with altitude. Well, there is a relevant flaw in the AOGCMS that pretty well describes why the models predict a Hot Spot that observations so far contradict. You can see above that the models create too much V-component wind encroaching on the tropics. The models create too much precipitation and a double ITCZ because they create too much C ( Convergence ). 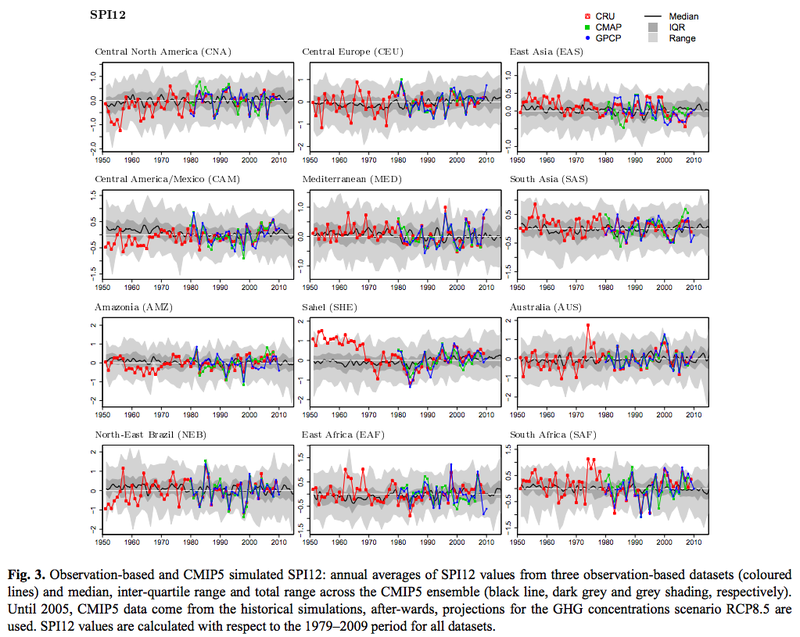 And unfortunately, as the paper details, the problem has gotten worse, not better from CMIP3 to CMIP5! This may not be all that surprising. GCMs are limited by the same prediction horizon ( seven days or so ) that weather models are. There is some sense that waves regress to the mean, but I don’t believe that’s correct. There are anomalies of motion at decadal and centennial scale that reflect variation composed of changes in frequency of the 3-day synoptic scale events. The exception is the boundary layer of the tropics. In this lowest layer, with respect to the layers above, parcels are conditionally unstable. Convection occurs, not spontaneously, but when some event lifts a boundary layer parcel into the layers above, wherein latent heat provides buoyancy for further lift. That’s why the models above, which provide too much convergence, also create too much convection: convection the tropics is not limited by conditional instability, which is ubiquitous throughout the tropics, but by the convergence which provides the condition of lift. Further, consider if instability were to lead to increased tropical convection ( and as above, convergence is probably a greater limiting factor ). What happens in a Hot Spot? Decreased stability. The presence of a Hot Spot would be a negative feedback to the sustainment of a Hot Spot. What happens in a Hot Spot? Decreased stability. Should read: What happens in a Hot Spot? INcreased stability. ( warmer over not as warm -> more statically stable ). DeWitt: Since the height of the tropopause isn’t the same everywhere on the planet, warmth of the stratosphere may not determine where the tropopause is everywhere on the planet. 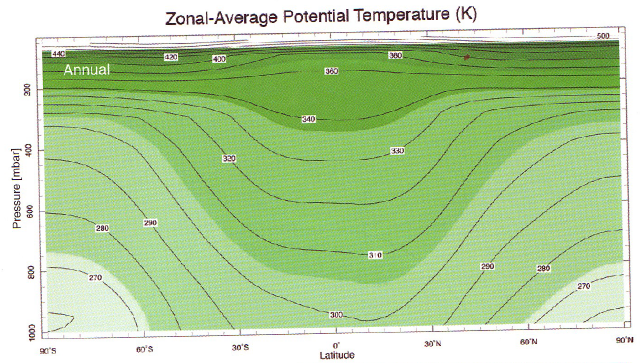 If there were no source of heat for the stratosphere, there would still be an interface between regions where temperature is controlled by convection (T varies linearly with altitude/pressure) and regions where temperature is controlled by radiative equilibrium (T varies linearly with optical depth?). One definition for the tropopause is the lowest altitude with a lapse rate of 2 K/km or less, which is the radiative equilibrium domain. That altitude exists whether or the stratosphere is warmed by absorption by ozone. In the tropics, the convective domain seems to bump into the domain heated by absorption by O3, producing a clearly defined tropopause in the tropical sounding used by Modtran. Non-tropical profiles seem to have a region where radiative equilibrium controls temperature, but the temperature is still falling with altitude because there little O3. This results in a tropical tropopause that colder than elsewhere on the planet. The putative missing tropical hotspot is located where the convective region and the O3 heated region touch. In fact, the tops of some tropical thunderstorms occasionally reach well into the stratosphere. If SWR cloud feedback is strongly positive, it can reduce the net flux across the TOA. But 5.6 W/m2/K is a massive change in albedo (102 W/m2). As we all know, models don’t do convection well at all. The grid size is too large. So anything involving convection is entirely dependent on how the net effect of convection is calculated. I.e., it’s the modeler’s choice, not necessarily what happens in the real world. Agreed. Models are parameterized so that the atmosphere overturns at about the right rate to produce current surface temperature, cloud albedo, and precipitation. Now raise surface temperature by 1 K. 7% more water vapor will be presumably be present in the well-mixed boundary layer over the ocean; potentially 70%*5.6 = 4 W/m2/K more heat headed upward if the rate of turnover remains constant. That is enough to negate the forcing from doubled CO2 if it eventually passes through the TOA as LWR! It occurred to me to look at the 3.5 K seasonal cycle in GMST used by Ramanathan, Manabe and other to study feedbacks. If climate models predict that precipitation is expected to increase only 1.7%/K during global warming, then how much should total global precipitation (or average precipitation) vary with seasonal changes in GMST. 1.7%/K * 3.5 K = 6% predicted seasonal increase in 2.53 mm/day global average, or a seasonal cycle with an amplitude of 0.15 mm/day. If atmospheric turnover doesn’t decrease as much as models predict, the amplitude could be twice as big. If it follows expectations from CC (7%/K), the amplitude of the seasonal cycle should be an easily detect 24%. Figure 6 in the reference below has some useful data. There is too much noise to see a cycle with an amplitude of 0.15 mm/day. I probably would see a cycle with an amplitude of 0.30 mm/day and it isn’t apparent in this data. And a 24% seasonal change in GLOBAL precipitation is totally ruled out. If I found the raw data for this graph and averaged several decades of monthly data, I probably could identify a seasonal cycle with a 6% amplitude. As with all of these seasonal analyses, we aren’t looking at global warming – we are looking at the net result of an average of 10K of warming in the NH and 3K of cooling in the SH, along with all of the differences between the two hemispheres. Precipitation is highly regional and perhaps half falls near the ITCZ where there is little seasonal change in temperature. I wonder how well AOGCMs perform at reproducing the seasonal cycle in precipitation – either globally or regionally? It would be a great way to prove or disprove that climate models correctly predict seasonal changes in overturning/precipitation. One thing we do know is that there is usually a lot more dust content than normal in ice cores towards the end of a period of glaciation. Some of that may be due to exposure of the continental shelf as the sea level drops. It would take a while to wash the salt out enough to make it fertile. Cold is dry. It snows very little on the Antarctic Plateau,, even during an interglacial period. During a glacial period it takes on the order of 10,000 years to accumulate enough snow, 60m IIRC, to seal off air bubbles compared to about 1,000 years during an interglacial period. I did a Google search on “Climate change is already causing worsening storms, floods and droughts”. 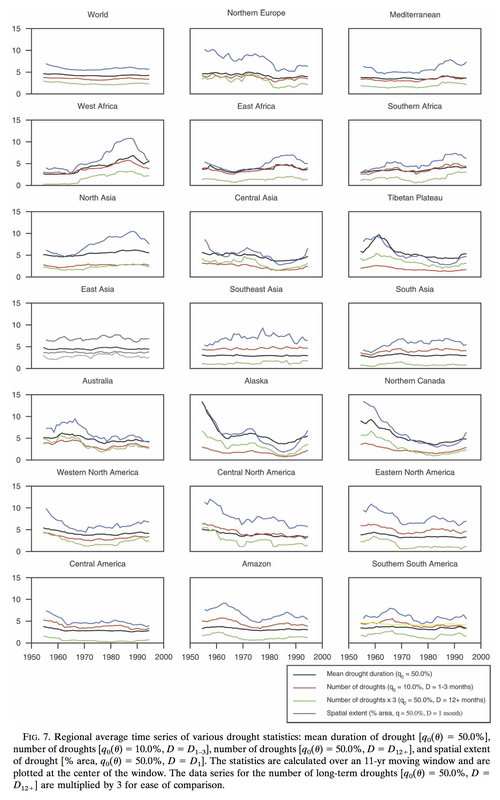 It looks like the IPCC position is an extreme outlier. There would understandably be riots if they were to take on any kind of government position responsible for dealing with climate change. Take any 50 or 100 year period. Is it a trend? Is it noise? How do we distinguish natural variability from changes caused by global temperature changes with this kind of data? I don`t think it is a good idea to long for an earlier climate. The Little Ice Age had some severe floods. The years 1342, 1643, 1551 and 1682 were worst in Middle Eurpe. A weather report from Albert at Volcano Cafe. “The winter of 1342, in the early phases of the Little Ice Age, had been cold and changeable. A rare earthquake hit the Netherlands in January. Eastern Europe had a cold winter, with much snow, and hard frosts in December and January; this was followed by very warm weather in late January which melted the masses of snow and ice. A second frost period came in mid February. In Western Europe, the hard frost only came in mid February, lasting until mid March. The melting snow caused rivers to rise, and the ice jams damaged many bridges. In January, Prague lost its famous Judith bridge to an ice jam. This was one of the oldest stone bridges in Europe, and the replacement (the Charles bridge) was not finished until after the year 1400. The Danube, Elbe and Seine all flooded in February. A storm flood hit Venice. After the winter, the spring was dry – so dry that in late May, the city of Mechelen caught fire (a common danger in the medieval towns, with wooden buildings, narrow streets and no water on tap) and was largely destroyed: thousands died. In other words, a normal year. The weather turned again mid-May and a rainy period followed. England had cold, heavy rains throughout June, becoming even worse in early to mid July. Only in August did the ten weeks of rain finally come to a halt and a period of warm weather followed. We know less about the weather in Central Europe, but some rivers in Germany flooded in mid June, so in some places the dry period in May had come to an end, but elsewhere it appears the drought continued until July. Of course, people were much more dependent on the weather than they are nowadays. There was little food storage, and if the summer was bad and the harvest poor, people went hungry and starved. Bad winters could also kill: central heating was a dream. But so far, 1342 had been ok, apart from the continuing trend towards colder winters. Impacts – Climate change was causing worsening storms and floods as the climate became colder from the 13th century. The most thorough analysis of the impacts of climate change was done by H H Lamb. CLIMATE, HISTORY AND THE MODERN WORLD http://ens9004.mza.infd.edu.ar/sitio/upload/08-%20LAMB,%20H.H.%20-%20LIBRO%20-%20Climate,%20History%20and%20the.pdf 1982 reprint 1995. It is very much to learn from Lamb. So a question: Should we long back to a colder climate? It’s hard to determine from impacts in the past whether the weather / climate was worse in the past. Developed countries have built dams for flood mitigation, improved building codes to protect against winds and storms, built tarmac roads, flood barriers, levees, produce good weather forecasts 24 hrs in advance, introduced warning systems..
That also raises the question, to be considered in a future article, how easily worse storms, floods and droughts – if they come to pass – can be managed. Just as developed countries today usually suffer minimal damage and loss of life from storms that would have caused major suffering a few hundred years ago. However, over the last decade the country’s capacity to deal with cyclones has improved considerably with the establishment of a cyclone warning and evacuation system. For example, cyclone Sidr in 2007 claimed far fewer lives (approx. 3,500) than the 1970 and 1991 cyclones, which killed at least 500,000 and 138,000 people, respectively.. So impacts (damage, loss of life, etc) relate to severity, but not in a constant way over time. And it can go in both directions. How many people lived in southern Florida in 1800 versus today? What is the property value in vulnerable areas vs those same areas in 1800 (in constant $)? Property damage could be 100x higher in $ value (in real terms) with the same storms. Damage could be 5% of earlier periods with the same storms..
SoD Thank you for commenting. I think that the monsterous forces were bigger in earlier (and colder) times, as it is described by Lamb and others. The destruction was almost unbelievable. Frost, famines and pests came along. So you are right that the monster protection is better now. Something got lost: Lamb: “it is unlikely—in a cold epoch of apparently more or less world-wideextent with glaciers generally in a state of growth—that the general sea level was as high as it had been in the Middle Ages around AD 1000 and between 1200 and 1400, though the difference may have been only of the order of 50 cm. The frequency of such floods between 1570 and about 1720 must be attributed to greater storminess. May be that the sea level rise from the medieval warm period of 50 cm is a bit too high, but the principle stands. The knowledge of sea level rise has become better the last 35 years. Glacier fluctuations during the past 2000 years, Solomina et al 2016. LIA was of global significance (Grove, 2001, 2004).” A note: according to the figure in the paper the number of advances was on top around 1800 and fell after that. And the lowest number was between 850 and 1050. So there were many transient periods which may have triggered worsening storms and floods. Anybody knows? Historically there has been increased storminess in colder periods. As a french study shows. “Major storm periods and climate forcing in the Western Mediterranean during the Late Holocene.” Jean-Philippe DEGEAI (1)*, Benoît DEVILLERS (1), Laurent DEZILEAU (2), Hamza OUESLATI (1), Guénaëlle BONY (1), 2015. A comparison of the Bagnas Sr record with paleoclimate proxies in North Atlantic, Western Europe, and Western Mediterranean shows that the phases of high storminess activity occurred during cold periods. Moreover, the comparison with other storm proxies exhibits an in-phase storminess pattern between Northern Europe and the Western Mediterranean. The highest storminess activity occurred from 400 to 820 cal yr AD during the Dark Ages Cold Period, with an increase in the frequency of storm episodes. The Bagnas sequence records also periods of high storminess activity during the end of the Iron Age Cold Period and during the Little Ice Age. By contrast, the Roman Warm Period and the Medieval Warm Period were characterized by phases of low storm activity. More studies show increased storminess in the Little Ice Age. 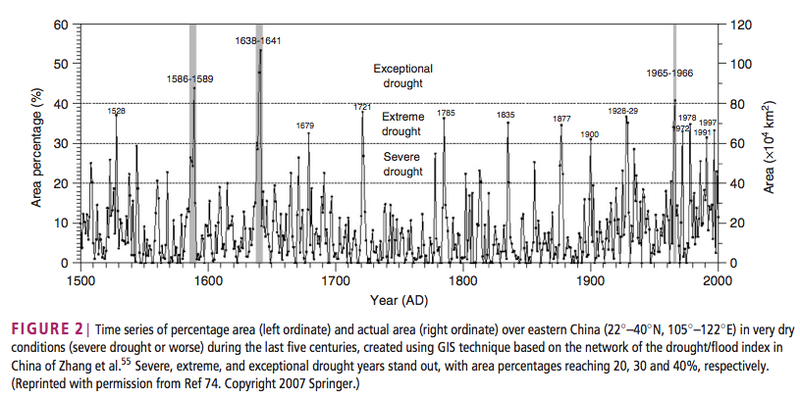 From ca 1350 there was a strong increase in storminess, with a peak from 1500 to 1800 until it declined ca 1850. Sorrel et al. (2012), S. Costas et al. (2016). So it seems that storminess has been on its highest when sea surface temperatures were on their lowest, during the last millennium. on September 18, 2017 at 9:53 pm | Reply Mike M.
That makes sense. Storms require turning heat (random molecular motion) into work (directed motion, like wind). That requires a temperature difference. It is well established that a colder world has a greater equator-to-pole temperature difference and a warmer world has more uniform temperatures. So a colder world ought to be stormier. At least it is lots of evidence for this in the Mediterranean and North Atlantic. Sea surface temperaures seem to be lowest during the last period of LIA in these areas. And storms were heavy. Big blocks were blown ashore some places. Coastal boulders in Martigues, French Mediterranean: evidence for extreme storm waves during the Little Ice Age. M. Shah-Hosseini et al 2013. Most of the rocks were transported by storms between 1660 and 1870. Mass between 14 and 35 tons. Since hurricanes are in the news right now, I have a question that has been bothering me for a long time – the supposed need for a 26.5 degC SST to create? strengthen? or maintain? a hurricane. How much stronger do hurricanes get when it is warmer than 26.5 degC? IIRC, Judith commented that Irma developed and strengthened over some of the coldest ocean (26.5 degC) to ever produce a major hurricane. Hurricanes have been described as heat engines. The maximum efficiency of a heat engine depends on the temperature difference between the warmest location and the exhaust point. For hurricanes, efficiency would appear to be defined by the temperature difference between the surface and the top of the hurricane, which I believe is located at the tropopause. In that case, the need for a 26.5 degC SST could reflect mostly from the need for a higher colder tropical tropopause. However, total power depends on both the efficiency and size of an engine. It isn’t clear why the magic 26.5 degC temperature should produce a “larger engine” and warmer SSTs produce even larger engines. SOD: I didn’t find a better place for a hurricane question at your blog. Feel free to move this question somewhere better – or if you intend to write about hurricanes, you can save the questions for a more appropriate time. I have wondered about the same thing, as it seems unphysical with a critical temperature level in that way. So I follow your reasoning, Frank. What seems to be the most important mechanism in the making of hurricans seems to be an extreme low pressure. And I think that it is the temperature difference in the atmosphere that causes this, more than absolute temperature. The strongest hurricane in US history had a pressure under 90. Hurricans are extreme variants of convection. It looked like hurricane IRMA brought warm air up to the tropopause. But the 26,5 deg C critical point is a good argument to spread panic, so I think it can be part of the propaganda. And when scientists believe it, it can sound as settled science, and become consensus bias. Hurricanes create low pressure at their centers. The bigger the hurricane, the lower the pressure. on September 17, 2017 at 12:45 am | Reply Mike M.
You ask excellent questions. So far as I can find, the requirement of at least 26-27 C is an empirical observation and is not absolute. As you say, it seems that what really matters is the vertical difference in temperature, but I think it is potential temperature that matters. If that link works as I expect, it will be item 4 in the list and not paywalled. Figure 1 in that paper. shows that lifting an air parcel in February results in rough equilibrium with the surroundings. But in September the parcel becomes much warmer than the surroundings, so there is a strong instability. If upper troposphere temperatures increase due to AGW, then it seems to me that the sea surface temperature required for hurricane formation would increase. on September 17, 2017 at 5:17 pm Mike M.
Frank, it’s fine here for now, thanks for asking. On the need, or not, for a 26.5’C SST to create a hurricane. I don’t know the answer but am reading some tropical cyclone papers at the moment. Not sure anyone knows the answer. Maybe the fog will clear at some point, let’s see..
IMO, there is a lot of handwaving oversimplification going on with hurricanes. If hurricanes are powered by the temperature difference between the SST and the hurricane top (the tropopause), then global warming isn’t going to increase hurricanes. In fact, a decreasing lapse rate (lapse rate feedback) will weaken then slightly. Nevertheless, a warmer ocean will have more areas above 26.5 degC capable of supporting and intensifying hurricanes. However, there is only a weak correlation between hurricane wind speed and the temperature of the ocean below. And wind sheer is projected to increase with GW. In my dreams, I imagine taking all of the hurricane storm tracks over a decade or two and looking at the change in winds speed over the next 12-24 hours vs the SST (and lapse rate and relative humidity and ?) of the water the hurricane encountered over those 12-24 hours. How does the probability of intensifying from TS to Cat1, or Cat1 to Cat2 change with SST (and these other parameters)? Collect data only over ocean. The experiments that need to be done seem to be extremely obvious (albeit time-consuming), which leads me to wonder why they aren’t publicized. I get the feeling that something besides SST in the Atlantic Main Development Region has been unusually favorable for producing intense hurricanes this past month, but I know these impressions could easily arise from cherry-picking based on the news. Likewise the Caribbean was favorable in 2005. Many strong storms seem to follow similar tracks in the same month. The 2016 review linked below indicate that the temperature difference between the surface and tropopause (not a 26.5 degC threshold) is important for hurricane intensification. There may have been more, but weaker hurricanes during the last ice age. The increase in Atlantic hurricanes in the last few decades has been attributed to a fall in tropopause temperatures there. Abstract: Recent research has strengthened the understanding of the links between climate and tropical cyclones (TCs) on various timescales. Geological records of past climates have shown century-long variations in TC numbers. While no significant trends have been identified in the Atlantic since the late 19th century, significant observed trends in TC numbers and intensities have occurred in this basin over the past few decades, and trends in other basins are increasingly being identified. However, understanding of the causes of these trends is incomplete, and confidence in these trends continues to be hampered by a lack of consistent observations in some basins. A theoretical basis for maximum TC intensity appears now to be well established, but a climate theory of TC formation remains elusive. Climate models mostly continue to predict future decreases in global TC numbers, projected increases in the intensities of the strongest storms and increased rainfall rates. Sea level rise will likely contribute toward increased storm surge risk. Against the background of global climate change and sea level rise, it is important to carry out quantitative assessments on the potential risk of TC-induced storm surge and flooding to densely populated cities and river deltas. Several climate models are now able to generate a good distribution of both TC numbers and intensities in the current climate. Inconsistent TC projection results emerge from modeling studies due to different down-scaling methodologies and warming scenarios, inconsistencies in projected changes of large-scale conditions, and differences in model physics and tracking algorithms. The now well-established thermodynamic theory of TC maximum PI continues to be investigated and refined. In addition, there has been considerable work done since 2010 analyzing the ‘relative SST’ argument, namely that TC characteristics such as PI in a basin can be affected locally by basin SSTs because tropical upper troposphere temperatures tend to follow the global tropical average instead of the basin average. Thus, the relative SST can serve as a useful although not perfect proxy for PI. Camargo et al. and Ting et al. indicate that the decrease in PI in the Atlantic basin caused by aerosol forcing and its increase due to greenhouse gas forcing largely canceled each other, and the sharp increase in the PI in the last 30 years in this region was dominated by multidecadal natural variability. They argue that this is more effective in increasing PI than increases in SST related to climate change. 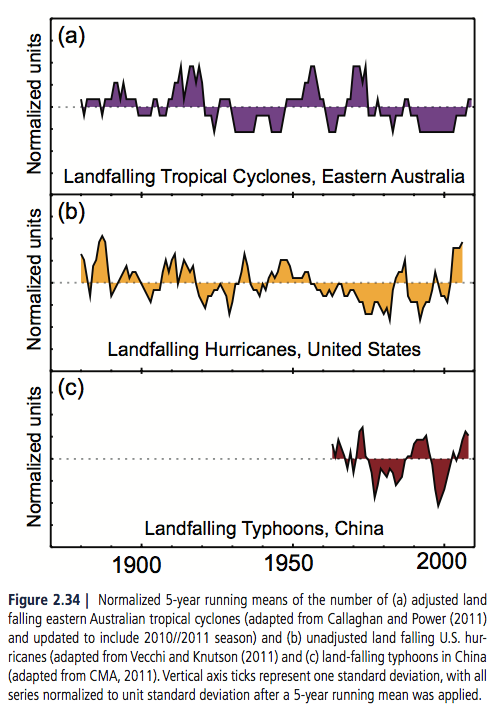 In contrast, the observed increases in both global and basin proportions of intense hurricanes found by Holland and Bruyère were all related to global changes, which models indicated were arising from anthropogenic effects, and they could find no natural multidecadal trend in the models that could explain this behavior. Projections are uncertain on whether relative SST (or tropical storm frequency) in the Atlantic basin will increase during the 21st century under GHG forcing. In addition, the role of tropopause temperature trends in observed changes in the PI appears unresolved, thus reducing our confidence in future projections of this relationship. For both the Holocene (6 ka before the present) and the Last Glacial Maximum (LGM; 21 ka), Korty et al. show that even though conditions during the LGM were cooler than today, there was not a systematic decrease in either PI [potential intensity?] or other environmental variables associated with TC frequency. Sugi et al. found that their model-simulated TC frequency significantly increases in a 4K cooler climate GCM experiment, indicating that there may be more TCs in a glacial period, consistent with the consensus finding that overall TC frequency decreases with warming43 and showing that a climate with generally cooler SSTs does not imply fewer TCs. They also pointed out that TC formation under these conditions can occur at sea-surface temperatures (SSTs) well below 26C, a value conventionally used to indicate the minimum threshold for TC formation in our present-day climate. Merlis used the GFDL HiRAM model to show that TC frequency was simulated to increase during the LGM.